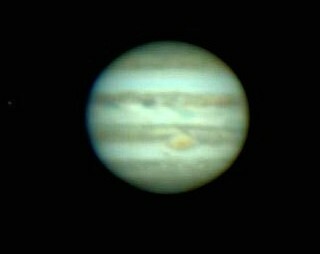 When I shot this image I wasn't aware that the great red spot was visible on this night. SURPRISE! It didn't show up until I post processed the image. You can see a small storm southwest of the GRS in this image as well. Method: Stacked, aligned and wavelet processed in Registax. Balanced in Photoshop.